Be honest about your age, educational qualifications and job information. Don’t lie about your height, weight, marital status. You cannot hide it forever. It is best not to criticize your ex, whine about past relationships and sound desperate. Do not put rigid conditions- US born, lawyer, doctor or specific careers as it limits your chance of finding the right person. Be concise and clear about yourself. Post a recent photograph that clearly shows your face. It is better to keep a profile name and not divulge your contact information, address and email address. Only share it with people that you would like to take it up further. There is no requirement to put demands like looking after parents or siblings. It is the perfect way of making others stay away. It is important to post photograph so that your profile is seen by other members. Who knows someone viewing may be your potential life partner. Fill in all the details and do not leave the registration form incomplete. Allow people to know you better and show interest. 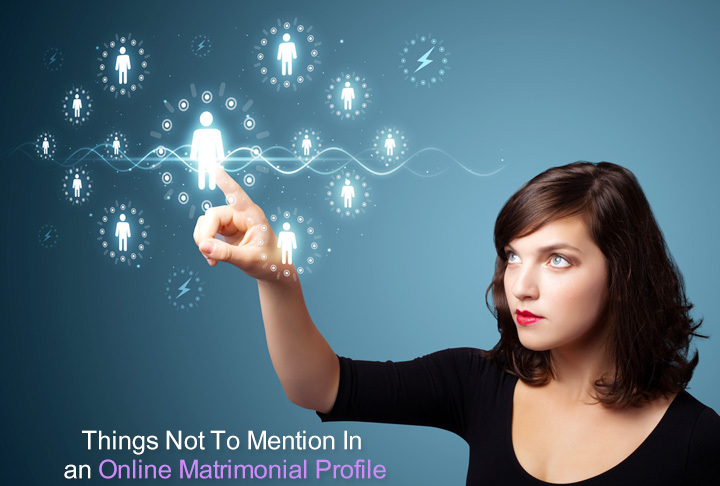 The reason being on a matrimonial website is that you are looking for your life partner. Halfhearted attempts do not produce good results. What you sow you will reap. You need to be responsible for your own life and when you are taking such a big step in finding a life partner, don’t leave the responsibility of filing the forms on your family and relatives. Do it on your own. After all you know what you are looking for and if you don’t want to put your best foot forward, why would anyone be taking interest in your profile? That is one of the reasons that it is important to have a responsible attitude for your own better life.